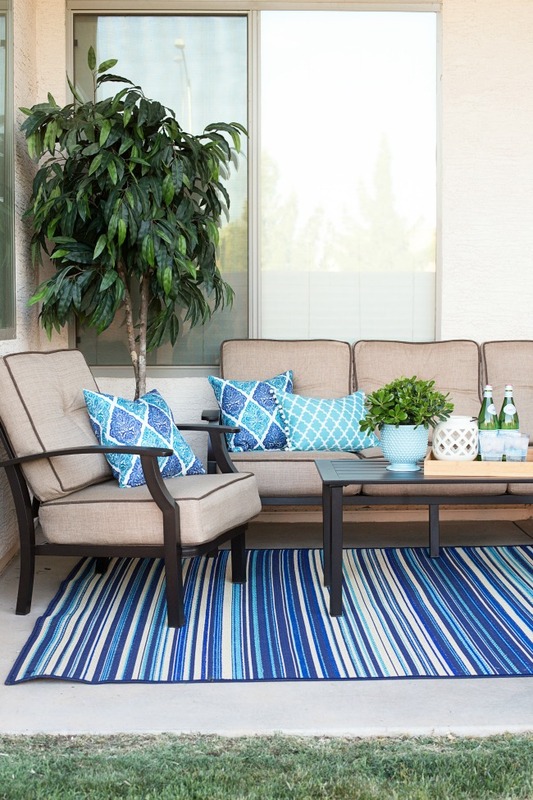 Update your outdoor space with these Easy Outdoor Patio Makeover tips! This post is sponsored by BHG Live Better. Hi friends! I don’t know what the weather is like where you are – but here in sunny Phoenix, AZ it is just that – sunny and WARM! It’s the perfect time of year for us, so we’re breaking out the patio furniture and enjoying the great outdoors! Such a great way to ring in the spring! Well we were so fortunate this year to get a brand new patio set from Better Homes and Gardens at Walmart! 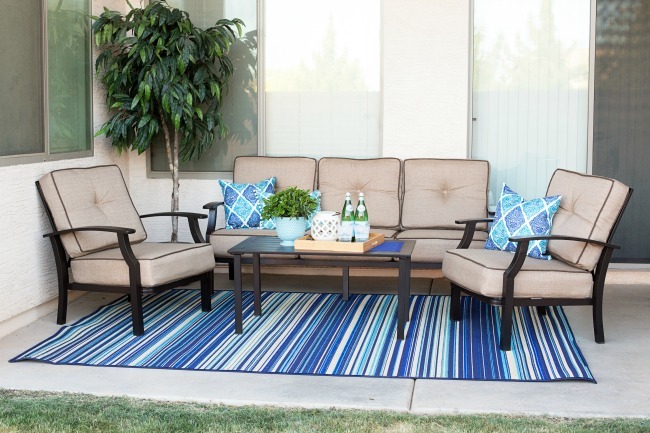 And let me just tell you – the Carter Hills Outdoor Conversation Set from BHG at Walmart is one amazing set! It arrived in one large box (how convenient is that?) and it was a breeze to put together – our boys even helped! They were in charge of the cushions and getting rid of the trash, they took those jobs very seriously. But in just an hour we had a FULL and functional set for our patio that we love! Just look at the transformation of our space and we’ll go into how we set it all up! Step 1 – Outdoor Rug. We defined our outdoor area that is just a slab of boring concrete with a versatile outdoor rug. 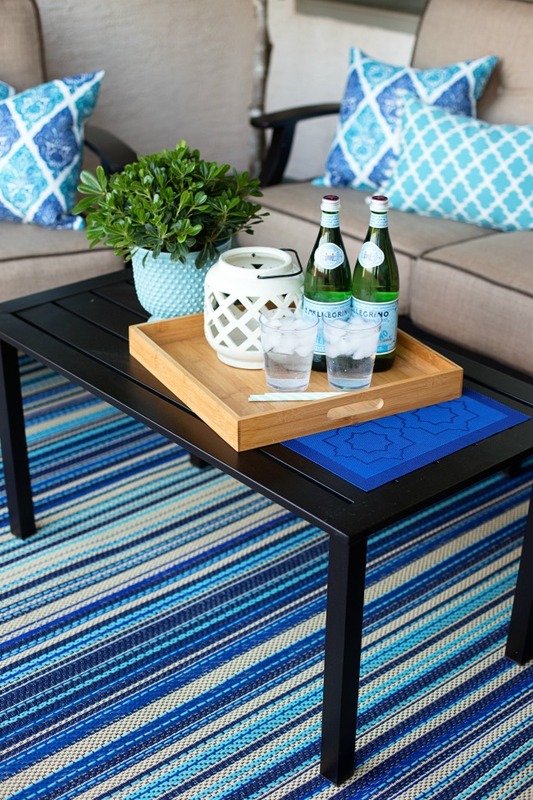 Blue is a hot color for this summer so we picked this lovely striped number. It really woke up the space and was the foundation for the rest of our patio makeover! Step 2 – Patio Furniture. Next up we added our newly assembled Carter Hills Outdoor Conversation Set! I couldn’t have asked for a better style and seating for our family of 5. 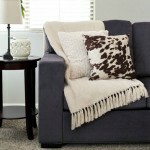 The cushions are thick and cozy and you can tell that it will all stand the test of time. 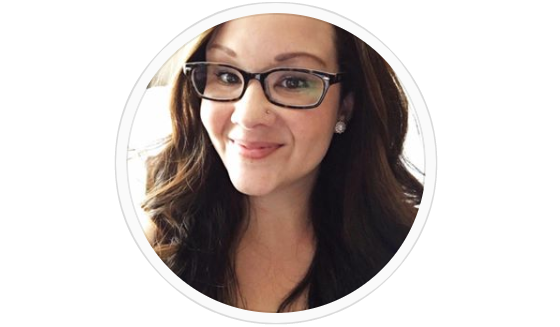 That’s one of my favorite things about BHG products at Walmart – the quality! 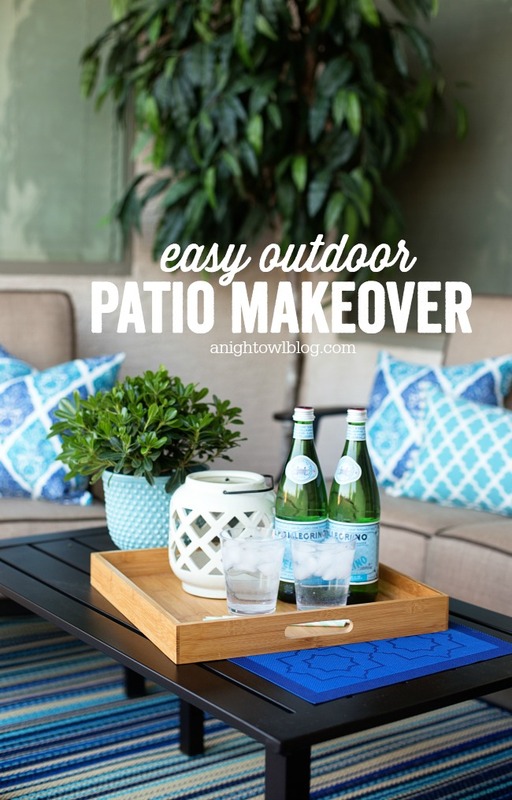 We updated a little patio space 3 years ago with BHG products and they still look the same! We have these same chairs and pads in a different spot in our backyard and even in the Arizona sun and heat they have stood the test of time! Step 3 – Plants and Planters. It’s an outdoor space so spruce it up with some fun foliage! We added a simple little tree in the corner and a small plant on the table in a cute little planter to match the color scheme. It adds so much life to the space, literally! 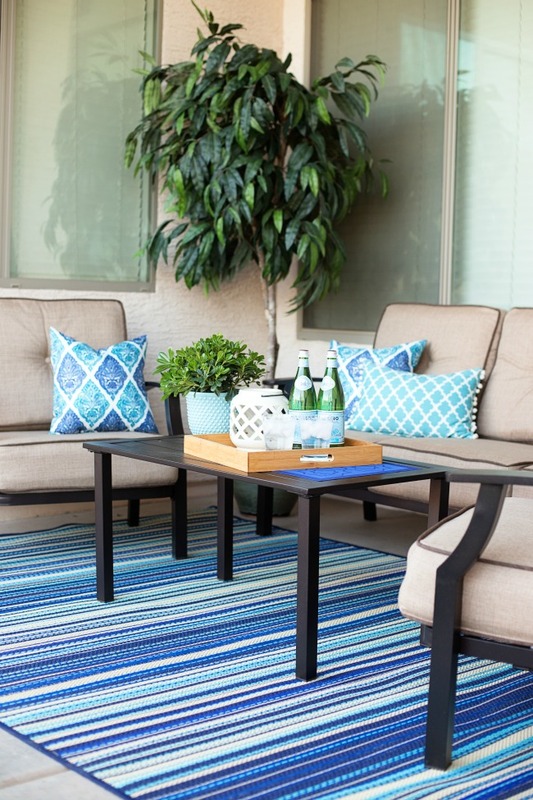 Step 4 – Outdoor Cushions and Pillows. 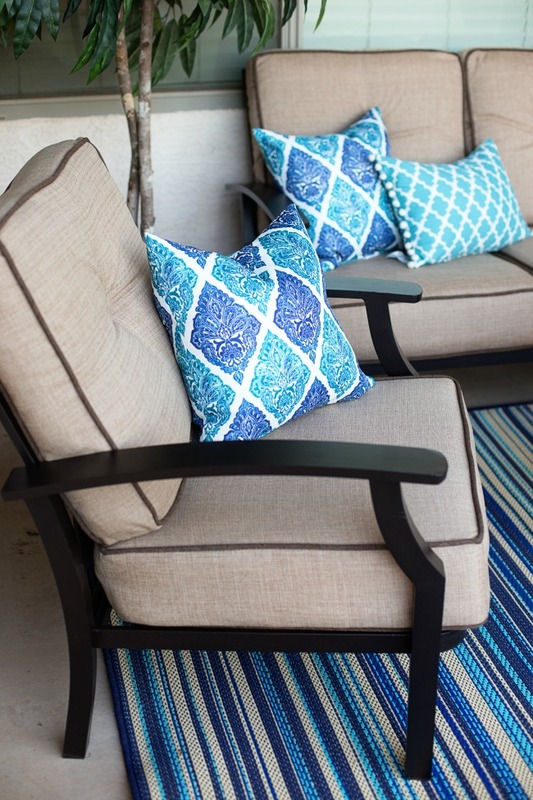 Cushions and pillows bring instant appeal to your outdoor space! 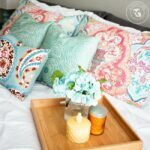 While I like to keep the main furniture neutral, it’s simple to change up the look and feel of your space with outdoor throw pillows. They also make your space more inviting! Step 5 – Decor. 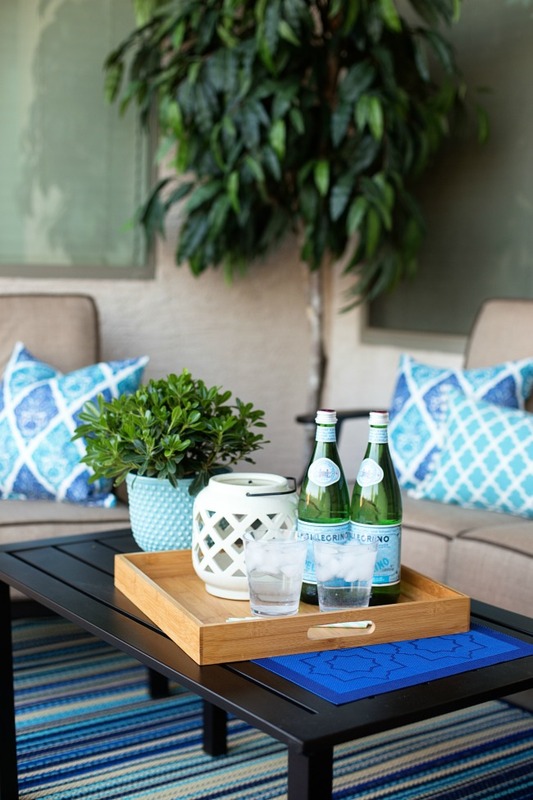 Just because it’s an outdoor space, don’t skip on the decor details! 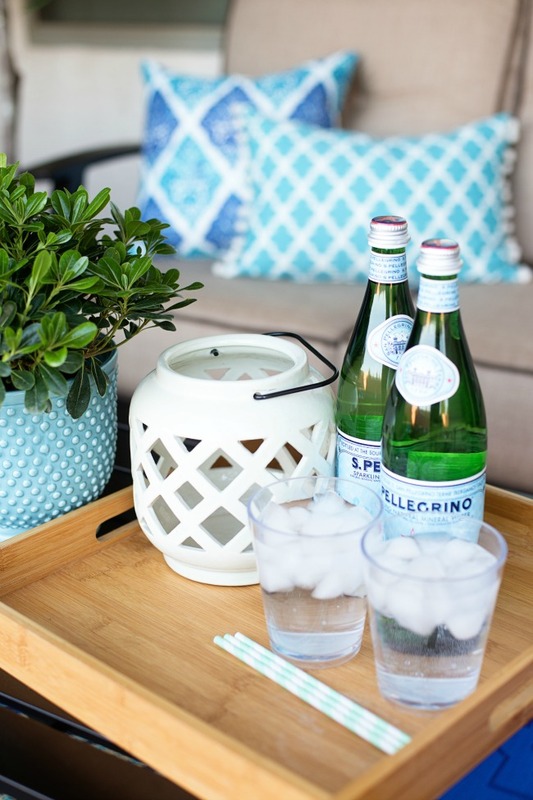 Add some lighting with fun lanterns and candles, layer the table with linens and our favorite bamboo tray! Now you have a complete space ready to enjoy! And ENJOY we have! We get outside now on the daily – I enjoy taking our new little one out for some sun and relaxation. Our boys love that we can sit out while they run around in the grass. Dinosaurs is their game of choice. We’re almost ready to break out our little pool too and this set is perfect to sit out, enjoy some lemonade while the boys get to splash around. 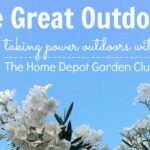 It’s just the start of outdoor weather for us – I’m looking forward to months of outdoor fun made possible by Better Homes and Gardens at Walmart! How will you enjoy your outdoor space MORE this year? 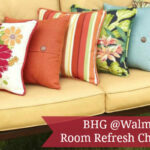 And NOW you have your chance to update your outdoor space too with Better Homes and Gardens products at Walmart! 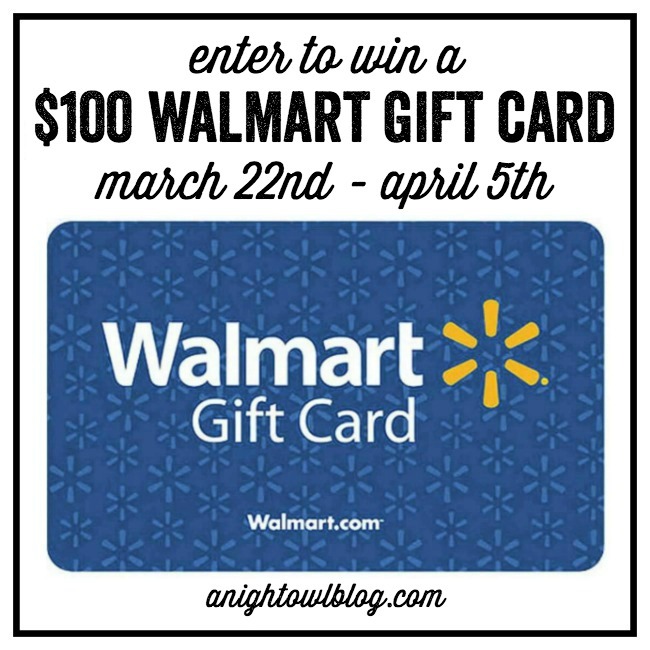 We’re giving away a $100 Giftcard to Walmart! Enter to win via the Rafflecopter below. Good luck! Your patio looks amazing! We desperately need to get some good furniture for our outdoor space! I absolutely love the time lapse image that shows each step of setting up the patio. Can you tell us how you made that picture? It’s awesome, but I’m not very technical so I have no idea how to something like that.